I have Windows 7 and I had not seen anything about this and didn’t know it existed, but now that I know about it I thought I would share it because I think it is such a helpful feature! So many times, I receive e-mails from subscribers trying to describe a problem they are experiencing and it is not always clear to me what they are trying to describe. With the advent of Window Seven that is no longer a problem! 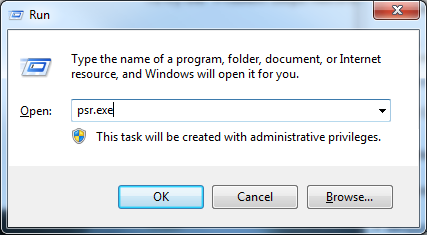 I am pretty sure that this useful feature is available to you in Windows 8 as well. If you have ever been in the position of offering support to many users on all levels, you will see just how helpful this handy little feature can be. Now, when a subscriber has a problem I will not have to rely on their description of the issue. I can now have him/her record the actions leading up to the problem. A big PLUS is that I can also use the PSR (Problem Steps Recorder) to quickly and easily create annotated tutorials! 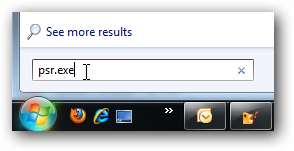 Click the Windows button + R and then key in psr.exe or you could also search for it at the bottom of your Start menu. The feature in and of itself itself is pretty straightforward and easy to use. As you can see below, there are just three buttons that you will use. Obviously, you will begin by clicking the Start Record button. Now, you simply perform whatever action you would like to illustrate to reproduce whatever problem you may be having. Your entire screen will be captured as well as every mouse click. Please note, however, that as you are recording steps, anything you may key in will not be recorded. If the text you are keying in is a relevant part of reproducing the problem you are trying to resolve, you must use the comment feature, described below. Try to be judicious with your clicking because every single time you click, PSR records a new screenshot, which may make your final file larger and more complicated than need be. As noted above, if text is relevant at any time or you need to clarify some element of your recording, simply click the Add Comment button in the PSR and you will be prompted to select an area of your screen. A dialog box will appear that will allow you to enter a comment. Doing so will create another screenshot in your final file, with your comment and the area you selected highlighted. Once you have finished clicking your way to reproducing your problem, Click Stop Record on the PRS. When you have clicked the Stop button, you will be asked where you would like to store the .zip file that has been created. Simply name it something that will be intuitive to you and save it in a file or folder of your choosing. This will be the file or “guide” that you will be sharing with the person who will be helping you resolve whatever issue you may be experiencing. You can now e-mail the file or share it with your IT person. You will do that by navigating to where you saved your Guide. You will note that there is a single file in the .mht format. Your system may not have a default association for .mht, but it is simply XML and you can open it with any up-to-date browser. It is a good idea to check your “Guide” before sending it off to anyone to be certain that you included everything that was relevant to your issue. Simply open the .zip file and double-click the .mht file to show it. If you are using WinZip, you may receive a warning, just click Yes to open it. Internet Explorer will now open with a single page that will display all your screen shots in the order that you captured them. You can view this as a slide show as well if you so choose. IE will caution you about being certain you captured only those screens necessary and will then at the end list the applications you were using under Additional Details. When you adjust settings for the PSR they are only saved for your current session. Once you have closed and reopened the PSR it will return to the regular settings. Click the Help down arrow + Settings. Output Location – if you do not want to be prompted to save a file after recording it, click the Browse button to set a default output file name. Enable screen capture – if you do not want to capture the screen shots along with the click information, select No. Number of recent screen captures to store – The default setting is 25 screens. You can increase or decrease the number of screen shots. PSR will only record the default number of screen shots so if you clicked 26 times but had 25 as your default, you would be missing the first screen shot in your “Guide.” The maximum number of screen shots is 100. Note that if your are using two monitors, both will be captured in one screen shot. You can see a larger image if you click on it and then click on it again to zoom in. I think you will agree with me that this is indeed a very handy little feature! Prev:Backup vs Imaging – what’s the difference? Thank you Carol. A nice tool to track your steps when trying to determine a problem (or even putting together a tutorial). I have read (in DCT) about 2 tools in Windows 7 that help soothe my dislike of 7 over XP.